1. TEACHING IS ALL WE DO. We are not a retail store selling instruments or music. This allows us to focus on providing our students the best possible music lesson instruction. We have over 30 years of experience in private music lesson instruction. Our teachers are experienced professional musicians that love to teach. But most of all they are able to adapt the lessons to meet the needs of each student. The best music lesson experience is one on one instruction. This allows the teacher to focus entirely on one student and gauge the lessons individually. 5. ALL AGES -BEGINNER TO ADVANCED. If you are new to music lessons we are very experienced with beginners and take them to very advanced levels. Catering the lessons to your interests also ensures a positive experience. We schedule our classes by age and level. All classes are supervised by a JTB Band Leader in a supportive environment. We have found the best results when the students come to the studio. The studio provides a professional atmosphere for music lessons. Though we do provide in-home music lessons, we find that lessons in the studio provided a more focused lesson experience. 8. 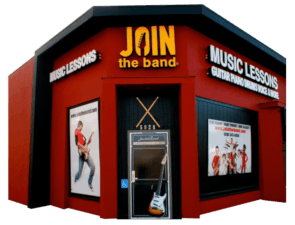 CONCERTS – “JOIN THE BAND” BAND PROGRAMS. With our popular “Join the Band” program, students can regularly perform for family and friends. With each performance we continually see more confidence in our students. We also are active in community events and we encourage our students to participate. Lessons can be catered to help prepare students for auditions and exams for their school bands and college. We have been very successful at preparing our students for these types of auditions and exams. We specialize in the audition requirements for Hamilton High School and Los Angles County High School for the Arts / LACSHA. We have seen our students attend prestigious local music high schools and colleges such as Los Angeles County High School for the Arts (LACHSA), Hamilton Magnet, Berklee College of Music, Juliard, USC, Cal Arts, and more! Choose a music school with experienced music teachers.